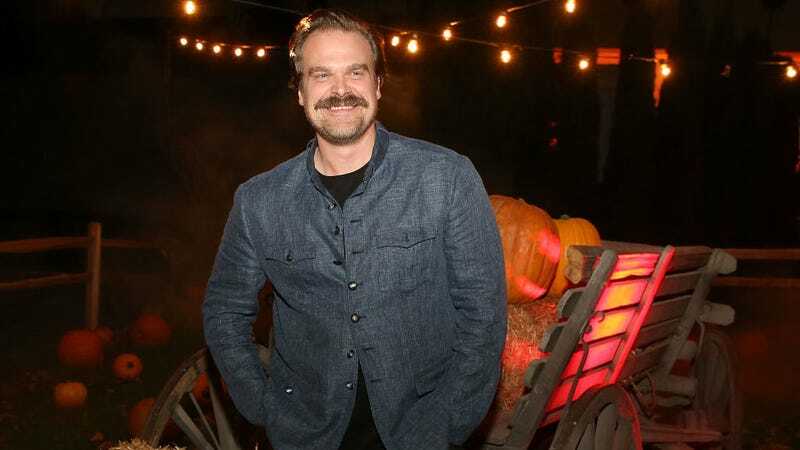 As previously documented, Stranger Things’ David Harbour is a fiend for retweets. After gorging himself on thousands of the precious things late last year, he went to a high school prom; now, stomach distended with the thousands upon thousands of Twitter notifications he demanded, Harbour made good on his promise to officiate a fan’s wedding from early this year. Having exacted his 125,000-retweet toll, the actor came to Springfield, Illinois as promised. In one of the few times anyone would be happy to have a cop show up at their wedding, Harbour even arrived as the khaki-clad Chief Hopper. Any suspicions that Harbour’s tweet may have been an elaborate, Netflix-funded Photoshop ad were allayed by a few delighted tweets from the wedding’s guests. It may not be as extensive a retweet-based adventure as traveling to Antarctica to hang out with penguins, but it’s still encouraging to know that Harbour follows through on what he says, even after emerging sober from the narcotic stupor of his latest social media campaign. Better yet, his willingness to show up in character for the wedding opens more doors for those willing to provide the man his due. Precedent established, the next question is how many delicious retweets Harbour would need to, say, come to a baby’s first birthday party in full, convincingly demonic Hellboy make-up.